Invisio | "For us confidence and capability is key"
"For us confidence and capability is key"
Ultra Electronics and its partner Cynetic Designs are working on a number of a “wireless power and data” solutions. 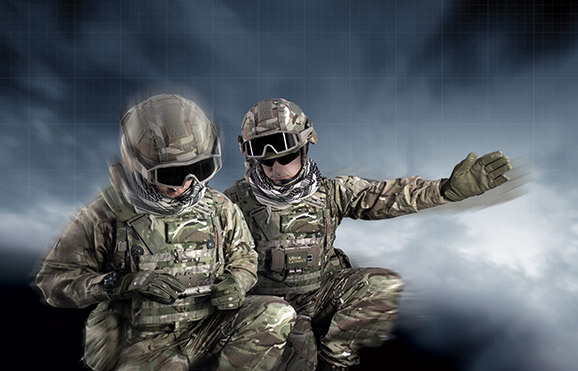 This technology can connect soldier worn devices without wires and even provide the soldier with a means to connect seamlessly to its host platform. Inductive transfer of power is a technology that provides an alternative power connection interface without the use of an electro-mechanical connector and that provides power too and within a soldier system in applications where conventional cable and connectors are problematic. Coupled with wireless data transfer using short range technologies such as low-power Bluetooth or Wi-Fi or NFC (Near Field Communication), multiple power and data system connections can be provided without the use of a conventional electro-mechanical connector. Inductive power transfer is environmentally insensitive as both the primary and secondary coils and circuits are completely sealed in a non-metallic material isolating them from the environment. It is unaffected by any liquids allowing deep submersion in water and exposure to ice, snow, mud, sand and POL’s. The inductive system requires no maintenance or cleaning to allow power to flow, providing enhanced ruggedness and reliability compared to traditional connectors and cables. Device usability is increased as associated cables and connectors do not need to be disconnected from the device for it to be used away from its storage pocket or to replace a dead battery. Two systems are available that provide over 100W of inductive power transfer from vehicle, aircraft or vessel seat to the soldier. The LPC (Large Planar Coil) system places the transmitting inductive coil in a vehicle seat back and the receiving inductive coil and rectification electronics in a soldier’s vest plate pocket or thin outer pouch. The transmitter inductive coil is environmentally sealed in a polymer enclosure and is inserted into any of several designs of fabric sling seat backs or slip cover design for head rest - bucket type seats. The vest secondary coil assembly is 25 cm (10”) in diameter, 4mm (0.2”) thick and weighs 300 gm (10.6oz). The secondary electronics enclosure measures 6.5 cm x 5.5 cm x 1.2cm (2.5” x 2.2” x 0.5”) and weighs 140 gm (5oz). 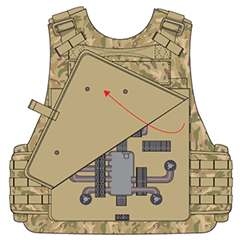 The paddle type, vehicle to soldier power transfer system, is an alternative to the large coil system, provides inductive power transfer by placing a small inductive power transmitting paddle into a inductive power receiving receptacle that is attached to a soldiers vest. The receptacle contains the secondary voltage conditioning circuit that provides DC power to the soldier system. The paddle is placed into the receptacle once the soldier is seated, providing continuous power until he stands up, separating the paddle from the receptacle without any action on the part of the soldier. The soldier worn secondary system attaches to the soldiers load carriage MOLLE system measures 8.0 x 2.6 x 7.0cm (3.2 x 1.1 x 2.75”) and weighs 108 g (3.9oz). Future systems will be available with wireless data and streaming video capability allowing any soldier seated with an APC to have full external environment awareness. Both the LPC and Paddle inductive power systems provide output power of 100 watts which is then ported to a lithium battery charger capable of charging either a 16.8V battery at 5A or a 28VDC at 3.6A. Inductive power transfer efficiency is typically in the order of 88-90% DC In to DC Out. In addition, each of the systems have been designed to allow the future incorporation of low power NFC, Bluetooth, or Wi-Fi transceiver circuits to provide both wireless power and data transfer within a fully shielded enclosure. Concept demonstrators have been completed for the twist on Li ion batteries for tactical radios such as the PRC-148, 152 and 159 that can now be charged from a modular pocket that eliminates the need for a charging cradle with electro-mechanical contacts in the base. The battery is attached to the desired radio, and then is slipped into a pouch containing the environmentally sealed inductive TX insert. Two configurations are available with either 18 watt or 30 watt charging capability at a power transfer efficiency of 83-88% (dependent on current draw in the charge cycle). By using an inductive charging pouch a Galaxy Note 5 cell phone, can to be removed from the charging cradle without having to disconnect a power/data cable. With appropriate housings, any device including tactical EUD’s can be intelligently charged in all environments including full submersion. With the addition of wireless data communication to the cradle, a complete wireless, environmental proof EUD system is provided. The Weapon Charging System is a contactless charger for the central battery of a weapon system that is equipped with a powered rail and a central battery. The application applies inductive coupling to transfer electrical power from a vehicle or mains power at a FOB, to a soldier’s weapon without the use of any connectors or cables to the weapon. The inductive transfer of power is facilitated by placing the stock of the weapon into a primary charging receptacle that receives electrical power from the vehicle. The stock of the weapon contains an integrated secondary inductive coil, rectification and Li battery charging circuits.